START YOUR ENGINES! Series 1 by T9G x Shoko Nakazawa x Konatsu Tunacan made their debut at Taipei Toy Festival and WonderFestival [Winter] back in 2017. Shanghai Toy Show 2018 saw the general release of the first series LUMISOFVI which incorporates soft vinyl with light-up functions and fast forward to 2018 BTS saw the latest versions of LUMICAR from LUMISOFVI x Unbox Industries which features designs from Shoko, T9G, Konatsu, Hariken, Dimmo World and Kik Toyz! Collectors live ourselves have been wondering when it’s our turn to own them. It looks like the wait is over, well kinda. For the West, a couple of retailers have started the pre-orders. Below are stock photos from BTS 2018. The question now is which ones will you go for? Will LUMICAR beat Mario Kart? HA. Unbox and Lumicar teamed up to produce a very special artist series for their ever-expanding die-cast range. Sculpting and production duties were overseen by the Unbox team while Lumicar manufactured the sweet ride that utilizes their patented lighting technology. “LUMICAR” is the first brand to utilise their own patented technology comprising of a power supply base and light emitter in a wireless system alloy toy car. The car does not require any built-in batteries but utilizes an advanced light-emitting device as long as the LUMICAR is placed on the “specially equipped” MANERGY base. 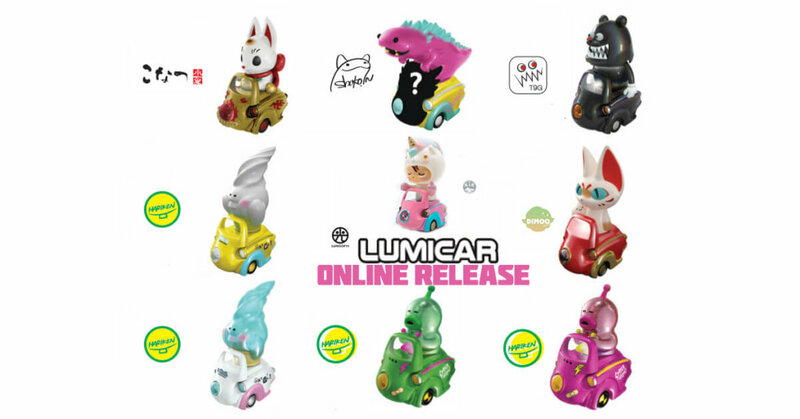 Enjoy the new Lumisofvi line of Lumicars driven by artist-designed toys! Each Lumisofvi set includes 1 complete soft vinyl figure and a die-cast car which lights up when placed on the power base. Separate the body and attach it to the Lumicar and it’s ready to go! – 1 power base with a custom graphic designed by the artist which lights up the Lumisofvi wirelessly! Please support your local retailer.